Pleace don't bring your own drinks! The festival is mainly financed by selling drinks and food and we try to keep the prices fair. We intent to provide a peaceful and pleasant festival for all. Pleace help us that it stays that way for you and others. Take care and respect each other, no stress, aggressive behaviour, violence, destruction or theft! We don't want sexist, racist, homophobic or in other ways discriminating behaviour. If you don't follow those rules you will be kicked out. Pleace don't bring national flags in any way (flag, clothes, camping chair or beer can) or from any country to the festival area. Dogs can easily annoy other people. Pleace put them on a leash or leave them at home. Anyway, loud music is not designed for sensitve dog ears. “Keine Knete trotzdem Fete” was formed in 2004 when a group of activists from Hamburg-Harburg had the idea to culturally use the by that time rarely used open air theater in Harburg's municipal park. It was immediately clear that no one will be financially enriched but uncommercial cultur should be made available for everyone. As a sign of lived solidarity and as a counterpart to dominant conditions, anti-capitalist, anti-Fascist and anti-sexist – a piece of lived utopia. After a break in 2005 the number of supporters for “Keine Knete trotzdem Fete” grew. Every year the festival got a bit more professional, bigger and versatile. 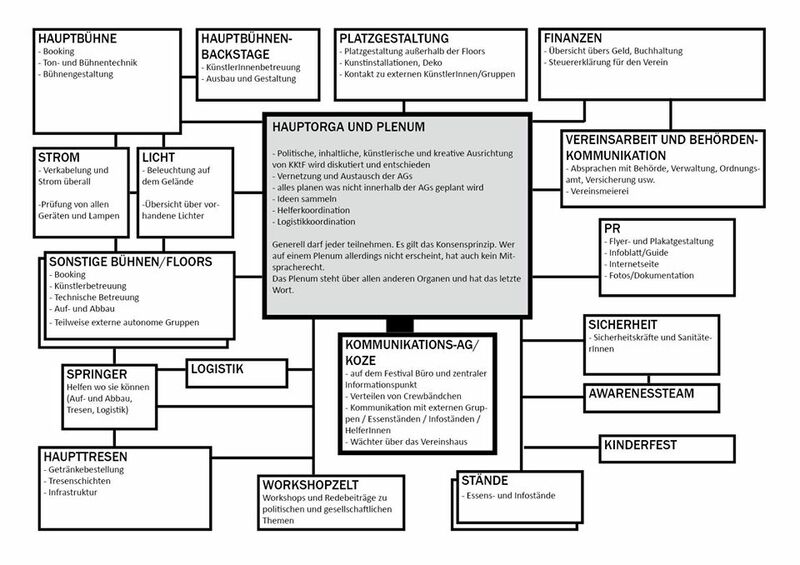 In 2012 the public authorities of the city of Hamburg denied the Kktf-collective to use the open air theater. Since then the festival takes place on the property of the metal fan-club „Tipsy Apes“ in Heimfeld – first thought to be a provisional arrangement we feel very welcomed at our new host's and the festival was able to grow three more stages and expand even more. We really need more people who want to join us and take responsibility! There are a lot of different ways to get involved. From sound engineering to bartending there is a lot to do. That includes the orgnization before the festival as well as the festival itself. You will obviously not get paid but you will meet lots of nice people and have lots of exceptional experiences - and at the end of the day the fun is most important! Just think about what you would like to do and sent us an email.